Adding blog filter on a page is nice way to make a stunning showcase of blog posts category wise. It is easy for visitors to find a blog with their desired category. Visitors can easily find posts for specific category by simply clicking category button. First, check out live demo of Blog Filter Plugin, and get to know how it looks. How to download Blog Filter Plugin? Go to the Plugins page from your admin menu of WordPress dashboard. Now search for “Blog Filter“. Click on Install button and after installation, Activate it. Go to the Blog Filter Settings Page and set the configuration as you want and then generate the shortcode with the click on Generate Shortcode button. You can add as many types of blog grids you want, because this plugin will not save any configuration, so you can change configuration and generate shortcode many times. After copy the shortcode, go to the add new page. Paste the shortcode in the content area. Here is the preview of the page with default configuration. 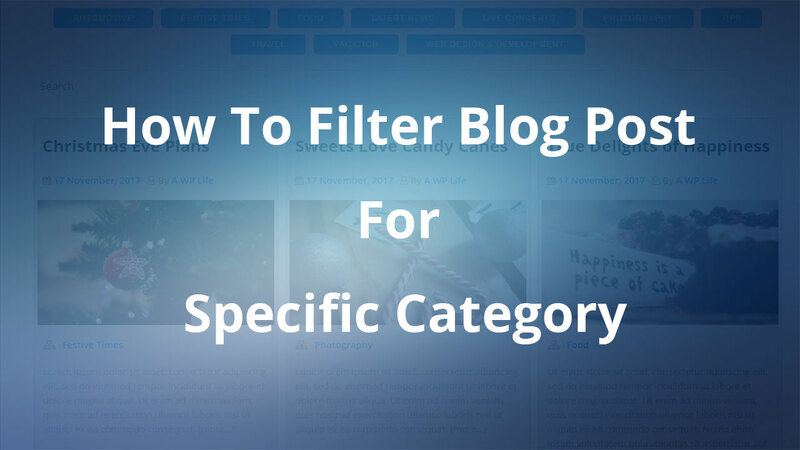 Blog Filter Plugin adds attractive filtering feature to your website and enhance user experience. It is fast and responsive WordPress plugin to make your website or blog more user friendly and attractive.